Last month, we launched our monthly On-the-Lot Trends Report to analyze consumers’ mobile shopping behavior while on a dealer lot for both New and Used vehicles. These insights are made possible through our recently patented Lot Insights technology. Our June On-the-Lot Trends Report showed consistent trends with various makes/models leading the way in VDP impressions. Some newcomers to make the list this month include the Acura TLX, Chevrolet Malibu, and Jaguar F-Pace. Check out the full report here. We also decided to give a sneak peek into July data by evaluating On-the-Lot data for one of the biggest Holidays of the summer – July 4th. We dug into trends beyond the makes and models that consumers were viewing while on the lot. One trend that stood out was the top exterior colors that walk-in shoppers were interested in. Overwhelmingly, black was the top color with almost 10% more VDP impressions than second place, white. Rounding out the rest of the top six were silver, gray, red, and blue, respectively. We’ve outlined the breakdown below. Additionally, we saw a variety of makes and models that had the most VDP impressions across various categories throughout the day. The Ford F-150 continued to reign in the top spot for both New and Used trucks, and Jeep continued to dominate the SUV category. 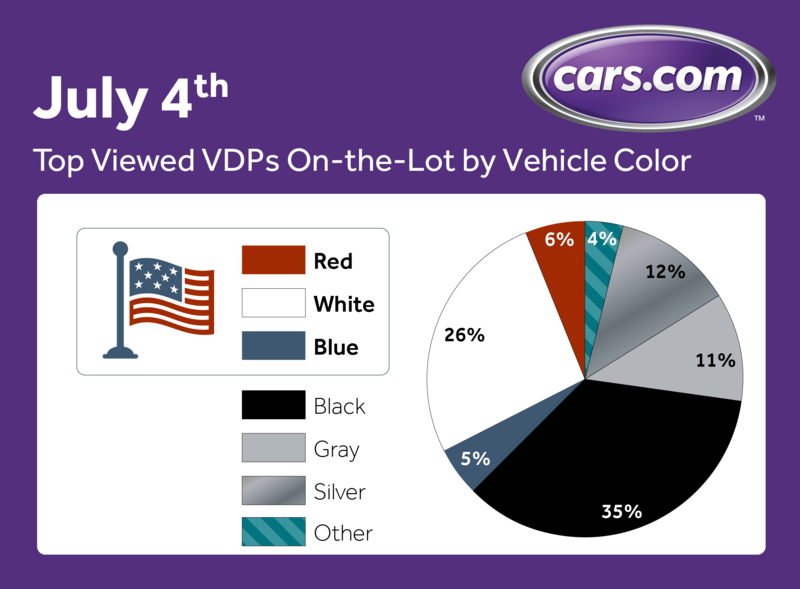 Check out the full data for July 4th below and stay tuned for next month’s On-the-Lot Trend Report.